The world's most popular party videogame is getting a lot crazier in Mario Party 8 for Wii! Whether you're shaking up cola cans or lassoing barrels, you and your friends will be drawn into the action like never before using the Wii Remote. 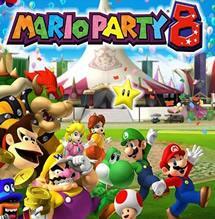 Mario Party 8 for Wii also includes dozens of new mini-games, six new party boards, and many new game modes. In a series first, players can transform their characters into many forms, such as player-smashing boulders and coin-sucking vampires. Mario Party 8 also includes "extra-large" mini-games like Star Carnival Bowling and Table Menace. One to four players can play Mario Party 8 for Wii, each with a Wii Remote. Mario Party 8 features seventy-three Mini-Games comprising; nine 1-vs-3 mini games, ten 2-vs-2 mini games, eighteen 4-player mini games, twenty seven duel mini games, five battle mini games, three challenge mini games, one final mini game and finally eight extra mini games which can only be found in the extras zone. Your Mii characters can be integrated into the Party games! Koopa Kid aka Mini Bowser is omitted from the game for the first time in the Mario Party series. This game took a lot longer to develop than its predecessors, I'd be running out of ideas 8 titles in too.